So, you’re thinking about giving your kitchen an overhaul. Whether you’re planning a complete refit or a quick makeover, colour will surely come into consideration. Grey has so many qualities; it’s versatile, it can be warm, it hides a multitude of sins (from marks to wall imperfections) – and of course, it’s right on trend. Just the thing for your new kitchen then. This scheme combines Quartz Flint 1 with warm mid-tone shade Maraschino Mocha 4 for a softer edge that will give your kitchen a welcoming feel. We suggest pairing these with a hint of Atlantic Surf 5 as a third, smaller pop of colour but you can find more colour scheme ideas on our Visualizer app. Flooring: For a contemporary look,try Oak Grey flooring. Sideboards: Bring a tactile quality to counter tops with timber, which gets the balance between rustic and industrial just right. Seating: A sociable kitchen means seating, so incorporate a breakfast bar or high counter. Even the smallest of ledges is enough for a friend to perch on while you cook. There you have it! A kitchen to make the heart of your home. 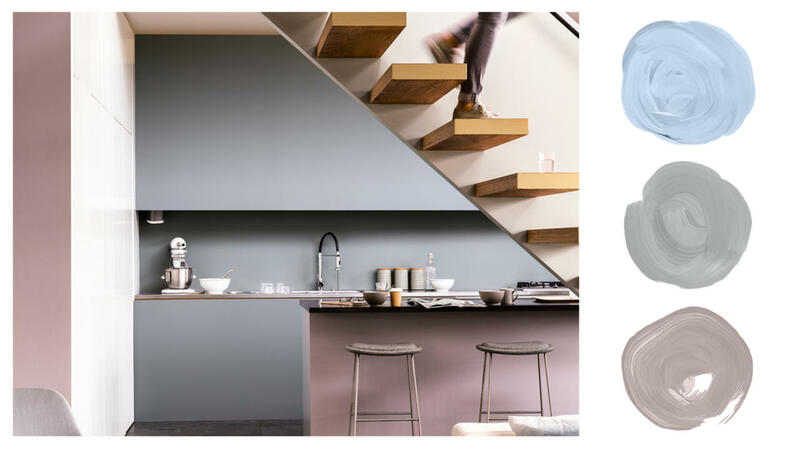 Kick-start your projects and see how these colours would look in your kitchen by downloading the free Dulux Visualizer app. Using Dulux Kitchen+ Matt colours ensures your paint stays exceptionally tough, grease and stain resistant.